James E. Kinney Senior Center - Times Publishing Newspapers, Inc.
For more information, stop by the center for a tour or call 215-357-8199. Need a place to host your next party or event? The Senior Center has a beautiful 3000 square foot party and meeting room at reasonable rates. Customized packages are available. Call the center director for further details. Activities include: Acrylic Painting, Aerobics, Art Studio, Ballet Class, Basic Drawing Class, Bereavement Support Group, Billiards, Bingo, Bocce (Spring & Summer), Book Club, Bridge, Canasta, Card Games, Ceramics, Chair Yoga, Coloring Club, Cribbage, Darts, Gentle Yoga, Golf (Spring & Summer), Indoor Shuffleboard, Luncheons, Luv 2 Dance Class, Mah Jongg, Meetings/Programs, Mindful Meditation, Pinochle, Poker Club, Scrabble, Seniorcise, Spanish Classes, Stained Glass, Table Tennis, Tai Chi, Tap Time, Trips, Watercolors, Wood Carving, Workshops, and Yoga. Hours of the Senior Center are Monday through Friday 9:00am to 3:30pm, Tuesday and Thursday 5:30pm to 8:30pm. 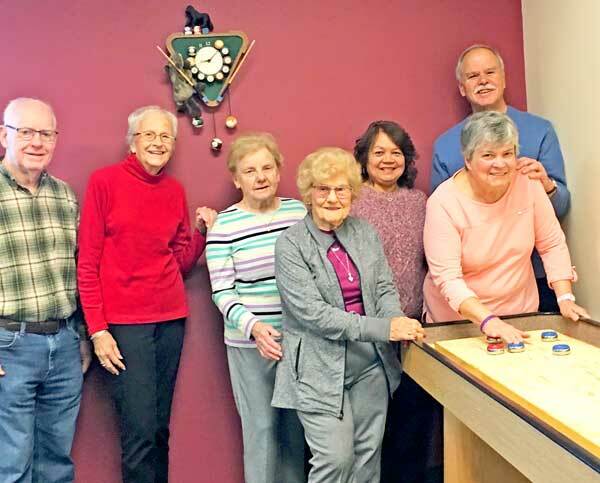 PHOTO CAP: The Kinney Center’s Shuffleboard League begins in November and runs through April. Judging from the sounds of the cheering and laughter that you hear, they sure have an “awesome” time.